The Fairness at Patriot rally in Henderson, Ky., on Tuesday sent me tripping back through time. Here we were at the County Courthouse at the edge of Henderson’s idyllic Central Park, where I worked and played for years, demanding justice for those who mine coal while celebrating the continued importance of that resource to the community. In this blog, I have written about the history of King Coal and Henderson, and the Mine Workers struggle for justice, including the series of rallies in St. Louis that challenged the bankruptcy court to do the right thing, which, sadly, it did not. But nothing hit home quite so dramatically as the rally on June 4. 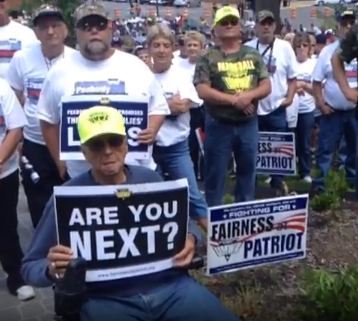 Again there was the deep sense of the moral outrage – expressed by politicians as well as labor leaders – for the abandonment of mining families and retirees by Peabody Energy and Arch Coal, the villains in this story. They dumped all the legacy liabilities and conveyed few of their assets onto a company that seemed to be created to fail, Patriot Coal, now in bankruptcy. Father Shonis, a native of Pennsylvania coal country who has ministered at the Henderson parish for the past decade, told the story not only of the rally but also of the union that has struggled for justice in the coalfields since 1890, when its founding President John Mitchell led the charge against the ruthless coal barons of the day. He also invoked the memory of John L. Lewis, the legendary president of the Mine Workers who revolutionized the labor movement by leading the CIO to organize industrial unions — from auto and steel to utilities and furniture manufacturers. The history of American labor largely began and was transformed through the Mine Workers – although the Locomotive Engineers, Carpenters and other craft unions may claim earlier roots. Today, the fight that UMWA President Cecil Roberts calls “the Mine Workers Traveling Salvation Show” is offering a warning and a prescription to workers of every stripe, in every industry. The signs waved across the park with the legend, “Are You Next?” carry special significance in an era when U.S. corporations are using bankruptcy courts to dump retirement obligations and seek unilateral changes in existing contracts. The UMWA campaign already has generated legislation in the House and Senate to protect retirement benefits for the miners, as well as calls for changes in the nation’s bankruptcy laws to prevent the easy relief for U.S. corporations at the expense of employees, a process that Roberts likened to “curb service” – just drive in and get what you want, few questions asked. I felt a sense of great pride as I listened to his words, to be a part of this democratic movement that bubbles up from the people who work for a living. And even though I’m no longer a practicing Catholic, I was also proud of Father Shonis and the Church’s longstanding campaign for social justice that he represented so well at the rally in my hometown. The Church’s teachings about social and economic justice are lessons I will carry with me all my life. They underline the truth and the strength of the labor movement, a galvanizing influence on our people and our democracy. Thanks for the reminder, Father Shonis.